Sunnybank Farm Cottages01568 797899work Self-cateringSet at the end of a no through road, Sunnybank Farm Cottages offer well equipped two bed roomed accommodation with outstanding views over the glorious Herefordshire countryside. We offer short breaks from a 2 night stay. The accommodation in both Pear Tree Cottage and Orchard Cottage is modern, light and well designed and each offers one double bedroom and one single. The ground floor is open plan with a fully fitted kitchen, including dishwasher, fridge with freezer, cooker and microwave, and a dining area and lounge with TV/DVD. Both cottages also have a downstairs toilet. Upstairs is a double bedroom and single room. The bathroom is fully fitted with a shower over the bath. High quality linen and towels, inc. tea towels, are provided for your stay and a welcome pack with essentials is provided. 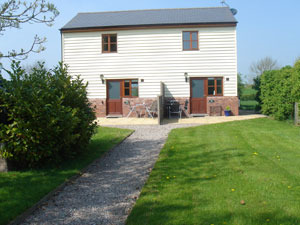 All fuel/heating is included, a telephone for local calls, free Wi-Fi and Sky TV with sport channels in both cottages. Outside there is a private patio overlooking the fields with patio furniture and a small BBQ is provided for alfresco dining. Ample parking is available at the front. Set at the end of a no through road, Sunnybank Farm Cottages offer well equipped two bed roomed accommodation with outstanding views over the glorious Herefordshire countryside. We offer short breaks from a 2 night stay. Both cottages share the use of a washer/tumble dryer in a utility room in the grounds, which also has a small amount of storage for items such as Wellingtons and is also a drying area for wet coats etc. Telephone is for local calls only Children welcome from any age. Sunnybank Farm Cottages are situated in Venns Green which is situated between Sutton St. Nicholas and Bodenham, northeast Herefordshire. A mile from the A417, which runs northwest from Gloucester via Junction 2 of the M50 or Junction 7 of the M5. From Hereford, take the A465 and at the roundabout at the bottom of Aylestone Hill at its junction with the A4103 take the exit signed Sutton St. Nicholas and Bodenham. Stay on this road for approximately 4.5 miles passing through the village of Sutton St. Nicholas. Once you have passed the Amberley Arms on your lefthand side, then go through the S bends and we are the next turning on your left signed Venns Green. From Leominster, take the A49 south to Hereford and at its junction with the A417 turn left towards Gloucester. Take the second right to Bodenham village, through the village and then look for the turning on your right signed Venns Green.